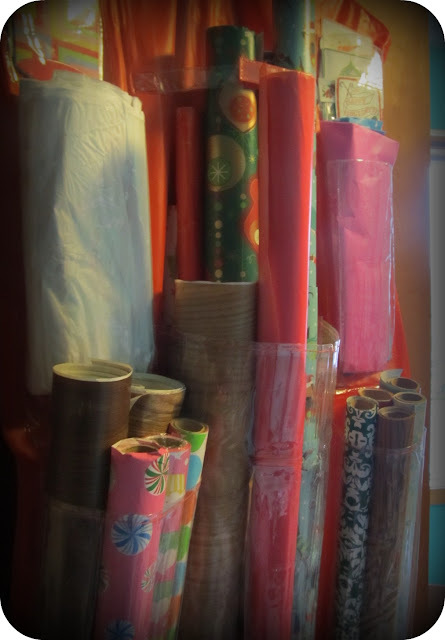 New Wave Domesticity: Tidy Tuesday : Wrapping Paper Organization! 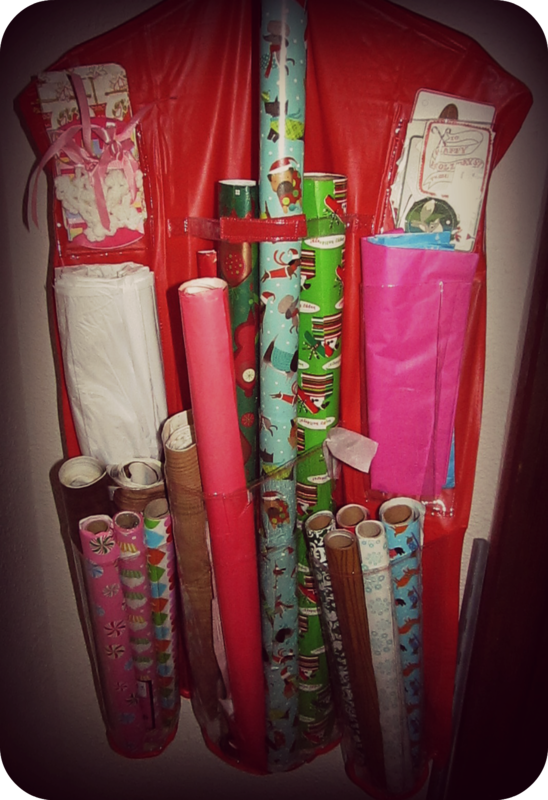 Tidy Tuesday : Wrapping Paper Organization! A few years ago, I bought one of these stand up wrapping paper containers at a yard sale thinking it would make me organized. In reality, it was just a big awkward catchall for me to throw any and all gift related junk into and it took up valuable closet floor space. I genuinely love the holidays and making pretty birthday packages and I dream of one day being able to have a gift wrapping station just like Martha Stewart, but that just isn't very practical for now. For now, I will settle for this handy giftwrap redo. I wanted something that could hand in my craft room closet and stay out of the way, so I bought this beauty from amazon for less than $10 (beware, you probably should also plan to buy a heavy duty hanger with it as well because if you have an arsenal like I do, your plastic hanger will break in a minute) and I love it. Now, I can easily see everything that I own at a glance and just be able to grab and wrap. It has multiple pockets so that I can fit all kinds of sizes of wrap as well as tissue paper and gift tags. The only real issue is that it didn't have space for my gift bags or ribbon. 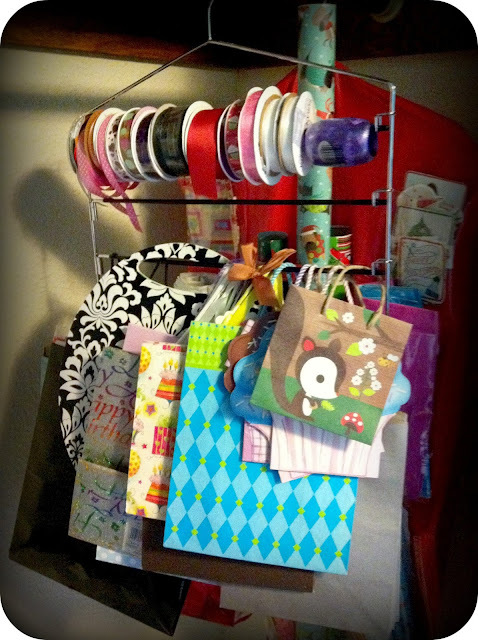 My solution was picking up a swing arm pant hanger (like this) from Target. It gave me plenty of room to store all of my ribbon & also have a few layers for all my gift bags. I am pretty excited that I now have extra floor space in my closet and my wrap, ribbon, and gift bags are all perfectly organized. Never again will I scramble to make the perfectly wrapped gift! Nice information about wrapping paper. $5 Meal - Easy Chicken Pad See Ew! Tidy Tuesday : Nail Polish Organization! 12 Nerdy Cupcakes That Any Geek Can Make!